For instance, Barbara Jones from Quilt Soup. Heidi Kaisand, you can find her here, here and here. 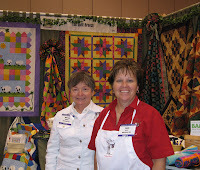 The Quilt Branch girls, Susan and Mary Jane. 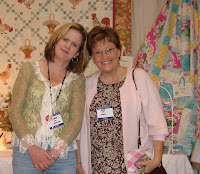 Me and Kaye Wood. 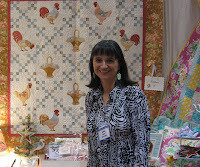 You know, I always wanted to quilt and when I was home on maternity leave 20 years ago I happened to see Kaye cutting away with a rotary cutter. It changed my life. Thanks Kaye! Tammy, Holly, Elizabeth and Sherry. Elizabeth and Jackie. More on Jackie's booth later. Uh, just in case you didn't know, we know the Urban Chiks. 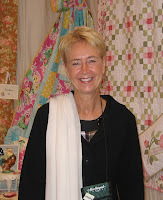 Cynthia Tomaszewski, Author, Quilt and Textile Designer! 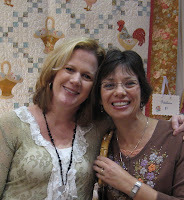 Kris and Karen, part of the famous Marketeers! Karen gave me a copy of her new book. Wow! Its wonderful! Check it out! Joanna of Fig Tree fame! The girls from Simple Arts! Annie and her daughter Kirstin and their helpers. Check out Annie's podcasts! Holly Mabutas of Eat Cake Graphics! I love her fresh style! There's still a bit more coming... stay tuned! Wow Pam! What a great lineup of celebrities. Thanks for sharing! Wow, lucky you! I am loving these posts! This looks like just so much fun! 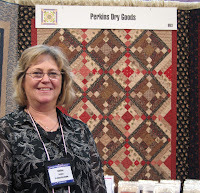 Hey P, is there a Quilt Market on the west coast? I'm dying over here! PKM, it looks like you had a fabo time at Market. Just got home from festival. It was wonderful!!! Thanks for the great pics. Enjoyed the pictures. Thank you for sharing them. Oh my! You were certainly were 'in the know' at market. . . even without a camera for a day! I am now realizing that there were people that I did not even get to see!!! (That's what I get for going home early on two of the three days!) Thanks for sharing your pictures Pam! Market is so fun through your 'eyes'! thanks for taking the time to post all of this! Can't wait to go! 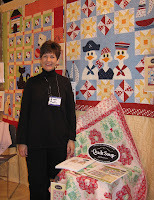 Love looking at the quilts behind the celebrities. If only they could move out of the way so I can have a full view of the quilts. hehehe! Just kidding! Thanks for sharing. HI!! 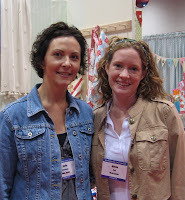 It was so great meeting you at market. We had a blast hanging out across from you guys. Thanks for all the sweet comments! The PIQF Meet and Greet!